Virginia Coop Credit Union Earns Recognition from BauerFinancial! We are very pleased again in 2018 to have received a 4-star Financial “Excellence” Rating for our Financial Strength by BauerFinancial, Inc. Receiving this award shows that we are centered on our member/owners and the communities we serve. Let me explain how we received this rating of 4-Stars for “Excellence”. The star ratings classify each credit union based upon a complex formula which factors in relevant data including, but not limited to: capital, historical trends, loan delinquencies, differences in the book and market values of the investment portfolio, profitability, repossessed assets, reserves, charge-offs, regulatory compliance and asset quality. (Although credit unions are not-for-profit institutions, losses can impact capital and safety.) Negative trends are projected forward to compensate for the lag time in the data. Each of the credit unions on this Recommended Credit Union Report is rated, with five-star being the strongest. Four-star is an “Excellence” on our zero-to-five-star scale. They are safe, financially sound credit unions that are operating above their regulatory capital requirements. Generally, the four-star credit unions had capital ratios between 6% and 9%. As we move into our 81st year of doing business our core purpose is to improve the financial well-being of our member/owners. Our annual meeting is just one example of how we can do this. Our board and management team are available for questions at this event. Please join us, Thursday, April 19th for the 81st Annual Meeting. 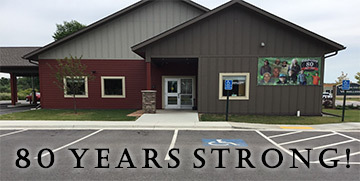 The event will be hosted at the Mountain Iron Community Center, starting with a Social Hour at 5 p.m. followed by Dinner & Meeting at 6 p.m.
As you may have noticed (before all the snow) we have several markers out on the adjacent property by our drive through. We purchased this land to help make your credit union more easily accessible. In 2018 we will be building an additional exit, so you can exit our facility without being stuck near the stoplight. VCCU will continue to improve and adapt in this ever-changing world and meet your needs with the best possible channels of delivery. Thank you for membership and ownership in VCCU.